Mindfulness means being totally aware of the thoughts and actions in the present moment. Mindfulness is all about being present in the present, with body, mind and heart and not thinking about either past or present. Most of us are so deeply caught in this web that we find it hard to be mindful (yes to live in the present moment). And not being mindful and thinking about past or present leads to stress and this in turn leads to the downfall of the mental and the physical health. So definitely there is a need for us to learn how to be mindful. Studies also prove this fact that those people who are mindful are happier, optimistic and have very less negative emotions. Not only this, there are many other benefits of mindfulness, let us look at them. 1. 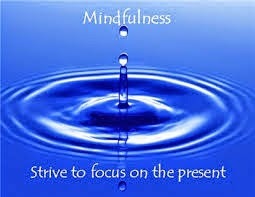 Mindfulness helps you to stay focused in the moment and in the present. 2. Mindfulness helps you to cherish and enjoy the work you are doing in the present, instead of doing it mechanically. 3. Mindfulness gives you feeling of total control and reduces other negative feelings. 4. Mindfulness helps you to make the right decision as you are totally here in the present with your body, mind and heart. 5. Mindfulness increases you immune system and helps you reduce stress. The above mentioned are few of the many benefits. So, there is no doubt that being mindful is one of the must to do things, for our own benefit. So give it a try.